In Holland, there are approx. 350 thatching companies, of which 250 have organised themselves in the Dutch Federation of Thatchers. Half of these companies have 1 thatcher (the owner). The biggest companies work with 25 or more thatchers on the roof. There are at present some 250 foreign thatchers working in Holland for Dutch companies, coming from Poland, Hungary and Estonia. In all, there are between 750 and 1,000 thatchers on the roofs today. Each of these will produce about 1,250 square meters a year. These companies make between 4,000 and 5,000 new thatched roofs every year (apart from a great deal of maintenance work). Of these roofs, about half are on completely new buildings, and Holland is unique in this. The other half is re-thatching existing buildings. Beside the thatchers there are traders and growers working in the Dutch thatching business. We believe about 1,500 people earn a daily living from the thatching industry in Holland. Thatching is a living tradition in Holland, and has always been so. 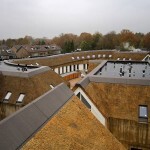 The Vakfederatie Rietdekkers “The Federation of Thatchers” actively promotes new buildings with thatch, by giving all possible assistance to prospective thatch owners, builders, and architects. By doing this, and working very efficiently on the roof, thatchers actually create their own market. 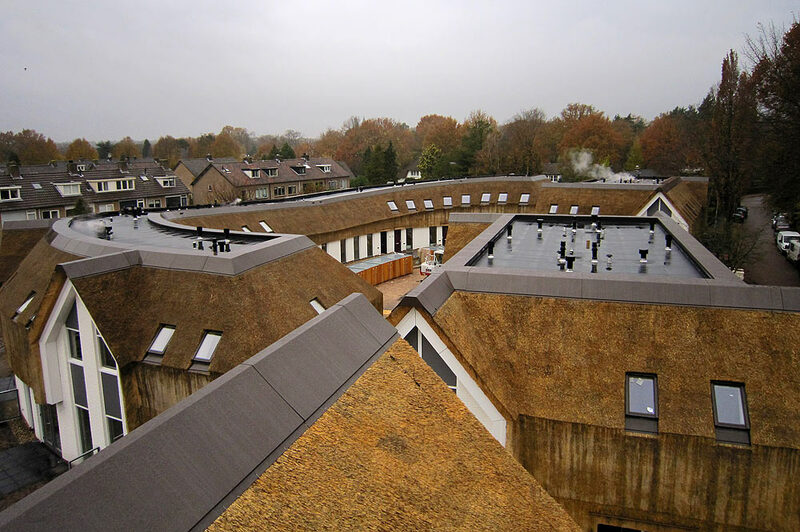 In Holland, the latest development in thatch is that we use in creasing amounts of reed each year as a vertical wall covering, which works very well and is heavily promoted by the Vakfederatie because of its long service life. (We do not experience any problems with the lifespan of thatch here). We make the most varied selection of thatched buildings in the world. Not only do we thatch cottages, farmhouses and windmills (for which we are famous), but also completely new day-centres for the handicapped, town houses, house boats, retirement homes and apartment buildings. We manage to do this, because we make thatched roofs on 2 different kinds of roof constructions; the traditional open lath construction and a newer closed “sandwich” construction, which is much more fire resistent. As a Federation of Thatchers we organise 2 training schemes for thatchers, where we train more than 25 persons a year (over the last 15 years more than 375 persons). On behalf of the thatchers, the Federation goes to building fairs, organises the publicity, has a quarterly magazine, a monthly email newsletter for its members, has an internet site for potential customers, etc etc. The Federation is also the main information body in Holland on thatch, thatchers and thatched houses. The Dutch Federation of Thatchers employs 3 full-time staff.